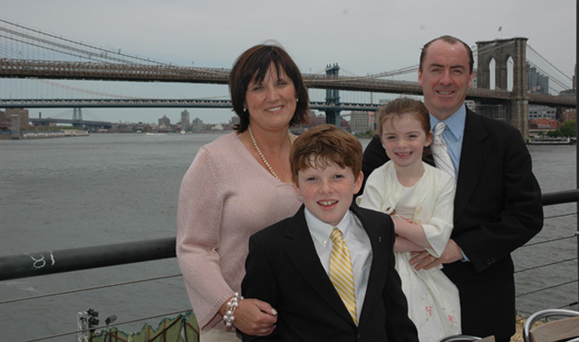 The parents of Rory Staunton, a brilliant and passionate Irish-American boy who died of sepsis at age 12, are on a mission to make sure that no other child is felled by this fatal infection. Rory died at NYU Langone Medical Center in Manhattan five days after cutting his elbow during an indoor basketball game at school on Wednesday, March 28. He became ill overnight and Orlaith brought him to the pediatrician on Thursday, March 29. Despite finding classic signs of sepsis (low blood pressure, pain, fever and mottled skin), the pediatrician did not see that Rory was already in the throes of what would prove to be an overwhelming, toxic response to a strep infection in his bloodstream, most likely acquired through the cut to his elbow. In addition, the doctors sent Rory home without reviewing his lab results, which showed massive numbers of immature white blood cells in his system — a known sepsis indicator. Rory was readmitted to Langone ICU on Friday, March 30 where a different rotation of ER doctors could see he was gravely ill. But it was too late. Rory died at 6.29 p.m. on Sunday, April 1, 2012. His sweat was still warm as his parents cradled his body. His parents were also unaware of the lab report until the hospital bill arrived at the house the following week. “The bill arrived with Rory’s mass cards,” says Ciaran. Orlaith, originally from Drogheda in County Louth, and Ciaran, originally from Westport in County Mayo, and their 11-year-old daughter Kathleen have spent the past 10 months trying to adjust to life without Rory. From their home in Sunnyside, Queens, they have also spent the past 10 months shaking the U.S. medical establishment from head to toe in an effort to make sepsis, like meningitis and heart attacks, part of an automatic checklist for patients and medical providers. Sepsis is an extremely serious condition caused by the body’s devastating immune response to infection. The body produces chemicals to fight the infection, in Rory’s case Group A Strep, but chemicals themselves cause widespread inflammation which can fatally damage the organs. It is a common but almost virtually unknown killer. It is the single biggest cause of death in U.S. intensive care units and kills 200,000 Americans each year, more than lung cancer, stroke and breast cancer combined. Yet a 2010 report found that 70 percent of Americans did not know about sepsis. Dr. Kevin J. Tracey, president of the Feinstein Institute for Medical Research at North Shore-Long Island Jewish Health System, which commissioned that report, says an early warning sepsis checklist is long overdue. Two years later, despite Rory’s displaying exactly those symptoms, the Stauntons would lose their son because the initial attending physicians were not concerned about sepsis. The Stauntons have lobbied state, federal and local officials to put such a checklist in place. “We want parents, doctors and medical workers across the U.S. to stop and say “Could this be sepsis?,” says Ciaran. They accomplished a major step towards this goal in January when New York State Governor Andrew Cuomo cited Rory’s case as the catalyst for sweeping new sepsis policies in New York hospitals. The New York Times reported that Rory’s death could save up to 8,000 lives a year in the state alone. The new policies include a countdown clock to begin treatment within an hour of diagnosis and requires regulators to develop new procedures for parents to “play a meaningful and informed role” in decisions about their children’s care. Both initiatives are a direct legacy of Rory’s tragic death. Ciaran says he hopes other state governors and federal agencies will follow suit. “These measures will make the difference whether people live or die, and Cuomo is clearly saying that he wants to see people living,” he says. Dwyer — who has written five articles on Rory’s case and knows the Stauntons — agrees. He says Rory’s story could transform the medical establishment. “There can be a kind of vindictive truth telling and a kind of a redemptive truth telling and I think that one of the things that have come out of this terrible, terrible episode is that Ciaran and Orlaith have moved the world forward with their redemptive truth telling,” he says. Like many who know the Stauntons, Dwyer was shocked at Rory’s death, and the speed and the severity of his decline. Dwyer says it was a worst-case nightmare of bad decisions and bad luck. “Every single possible bad thing that could happen, happened, to Rory and resulted in accelerating his decline. Nobody intervened when intervention might have helped. Every time there was a chance to do something for Rory there were steps that weren’t taken and people who didn’t know that there was a problem. “A healthy 12-year-old boy dying on any occasion would be shocking but to die in one of the country’s leading medical centers is just…” Dwyer’s voice trails off. Since Rory’s death, the Stauntons have set up The Rory Staunton Foundation and created a Facebook presence to raise awareness about sepsis. They have appeared on The Today Show and Dr Oz, and radio and TV shows overseas. They decided to go public on their private trauma to try and ensure that no other parent or family has to walk in their shoes. Rory’s story has touched hundreds of thousands of people. There were so many comments (1,659) on Dwyer’s first New York Times piece, “An Infection, Unnoticed, Turns Unstoppable,” that Dwyer himself weighed in. The publicity has already saved lives as parents around the country look at their sick children and ask “Could this be sepsis?” “One woman wrote to us to say that her 12-year-old son was standing next to her at the pool because of Rory,” says Ciaran. In November 2012, Ciaran spoke at the fifth international conference on medical errors at Johns Hopkins Medical Center in Maryland. One of the organizers, Dr. Gordon Schiff, said that Rory’s story was so compelling that they added a special session to focus on his case. Orlaith says she wants to see a clear communication path between the doctor in charge and the parents or guardians. Dwyer says Orlaith and Ciaran’s efforts to raise awareness about sepsis and work for change in the pediatric ER are inspirational. UPDATE: On January 29, Governor Cuomo announced that New York would lead the nation in fighting sepsis, with new requirements for hospitals to adopt best practices, and make major improvements in pediatric care though a set of rules titled Rory’s Regulations. Read the full release here. The Rory Regulations in New York State, I pray sweep the nation. The courage of the Stauton Family is spearheading such reform is more than incredible. They must relive the most agonizing moments of their lives every time they tell this story, but still, they persist. Having known Rory, I still ask, why him? How could this happen to our beautiful Rory? For all who knew him and loved him, this discussion happens on a daily basis. They say that only the good die young. I will never say that again. Losing Rory is too much to bear.